Viral marketing, if done successfully can prove to be very powerful, but it can be an extremely tricky business. One never knows what will catch viewers' interest on the world wide web. And nobody can predict with 100% accuracy what people will share with all their friends and colleagues. Therefore, attempting any kind of viral marketing campaign may just be foolhardy and a big waste of time. However, nothing ventured - nothing gained. 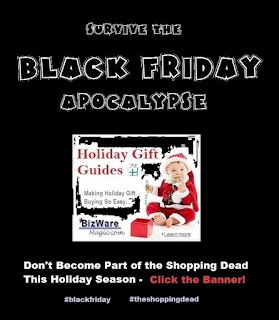 This year the Bizwaremagic site is promoting its many helpful guides and content with new banners dealing with the whole Black Friday buying madness. It has truly become a Black Friday Apocalypse - one of the most hectic shopping events or days for many online stores and merchants. Countless discount offers and deals can be had if one acts swiftly and decisively. For years, Bizwaremagic has been featuring the most current discount coupons from such retailers as Dell, HP, Alienware, Toshiba... and many more. Potential holiday gift buyers can get a jump-start on all the latest deals and bargains. The same goes for this year, and the Bizwaremagic site is gearing up with new content, new viral banners and new press releases to get the word out. If you're interested in seeing these banners or want to download any of our free gift guides with the latest discount coupons - just click this link.